I was recently contacted by Brandi at SpunkyFans.com. She wanted to partner with Plain Chicken for a giveaway to her store. I am a big fan of tailgating stuff, so I jumped at the chance. Brandi sent me this super cute chevron casserole carrier. I used it for the first game and it worked great! It is insulated on the inside so it helps keep your food hot or cold. She also sent me a few solo cup koozies. LOVE them! SpunkyFans.com has tons of cute items. I love the chevron bracelets and those chevron totes. SpunkyFans.com is giving one luck Plain Chicken reader a $100 gift card to spend at their online store! The giveaway ends on Friday, September 13, 2013 @ 11:59PM CDT. The winner will be notified via email and will have 48 hours to respond. If the winner does not respond within 48 hours, a new winner may be selected. Good Luck! These monogrammed items are adorable! Love them!! The casserole transporter would really come in handy! WDE! I would love one! I would love the casserole carrier. The chevron pattern is so different than what is out on the market right now! Love that carrier! The bucket is cute too! I would buy a casserole carrier. OMG I'm head over heels for that monogrammed insulated carrying case! i am not sure yet, lol. probably at least one of the casserole carriers. Thankyou so much for the chance to win!!! I'd order my sis-in-law some Clemson things since I didn't see any Ohio State items for my family. Cute items! 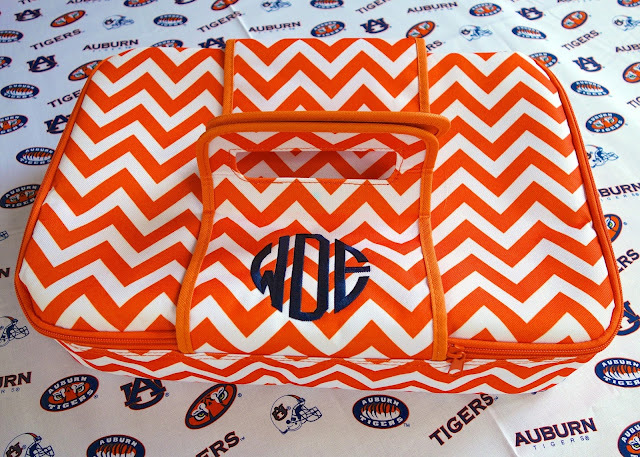 love GAMEDAY CHEVRON CASSEROLE CARRIER!! I would buy the Clover Monogrammed Otterbox Phone Case. Love this! roll tide roll! I love the casserole carrier and the chevron totes. I have to have these essentials! Perfect for the tailgates! I love the casserole carrier and the bracelets! These would all make great gifts. Love the tailgate gear and the pocket tees. I would love to get my step mom one of the monogrammed hats. So cute! I love the Chevron Totes! I love the casserole carrier!! I would get a casserole carrier - I've been wanting one for so long! I would get the monogrammed bucket! I'm all about some casseroles!! I would Just love the casserole carrier. It seems so fabulous! I love the otterbox phone cases! Love the casserole carrier. Go MIZZOU!!! I'd love the casserole carrier! I love the tote bags, casserole carriers, hats and t shirts, I could definitely find goodies to love! I love the Solo Cup Koozies! I love the orange chevron! I would first buy the Game Day Chevron Carry All Tote. I love that. then I would add a few more things after that. I would love this for tailgate! War Eagle! The casserole carrier is the coolest one I've ever seen!!! Love those casserole covers and the totes. Cute idea! Love the carrier and tote! Such great items!!! 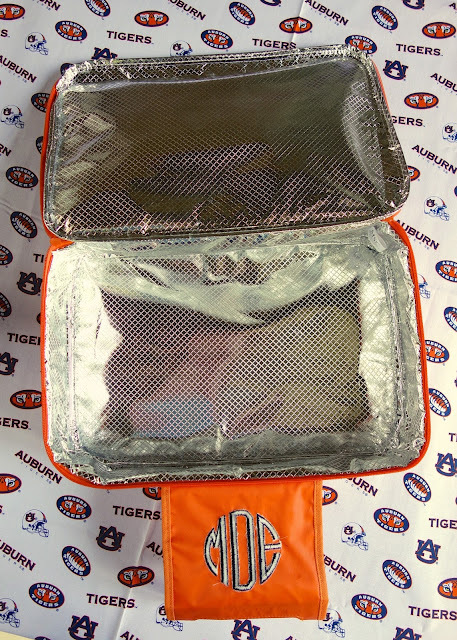 I love the Gameday Chevron Casserole Carrier...what a cool idea to keep food warm. I love the casserole transporter!! Love the casserole carrier and the pocket tee, too. War Eagle!! That chevron casserole carrier is awesome. Perfect for tailgating in "The Swamp"! Go Gators! I am loving the chevron casserole carrier! That is by far the cuties carrier I have ever seen! Would love to win one, thanks!! Love the chevron casserole carrier! i would love the food carrier! Too Cute!!! I couldnt wait and had to buy a koozie! I would buy one of the gameday chevron casserole carriers. Thanks. I would buy the casserole carrier. Love the carry all and solo cup koozies. anything chevron striped!!! Love the casserole carrier! I LOVE the chevron casserole carrier! So cute. I would have a field day shopping with the gift card! I would get the state of Texas football t-shirt and a chevron monogrammed cap. Thanks for the chance to win! I really like the Personalized Chevron Tote Bag and also the Koozie's so cute, thanks for the chance to win. love the t-shirts and the picture frames! Gameday Chevron Casserole Carrier and the State of Tennessee T-Shirt. Love the casserole carrier and the state football tees! Sic 'Em, Bears! Such cute things!! I love the casserole carrier, chevron phone cases, caps, t-shirts! Such a hard choice picking one thing! 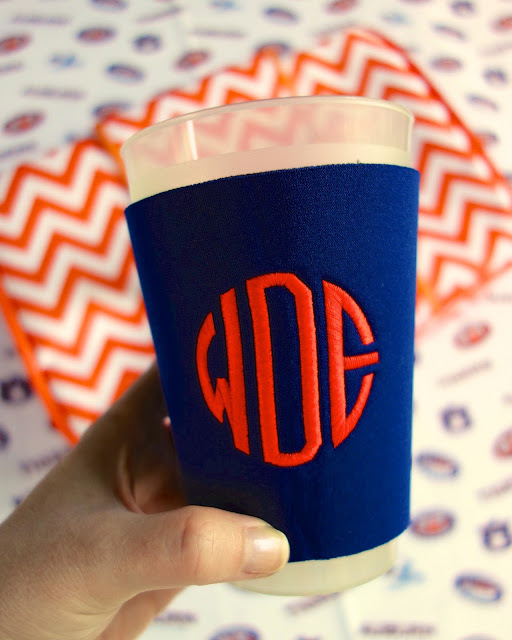 🏈WDE🏈....Spunky Fans had me at monogrammed Solo Koozies ! I need a new lunch bag! I'm loving the Solo cup Koozies! I would love to have this and keep it in the trunk of my car, so when I bring something to someone, I will have this casserole holder. I love the chevron bracelets! Super cute! Thanks for the great giveaway!! the chevron insulated casserole case it darling! I would buy the chevron insulated casserole carrier. 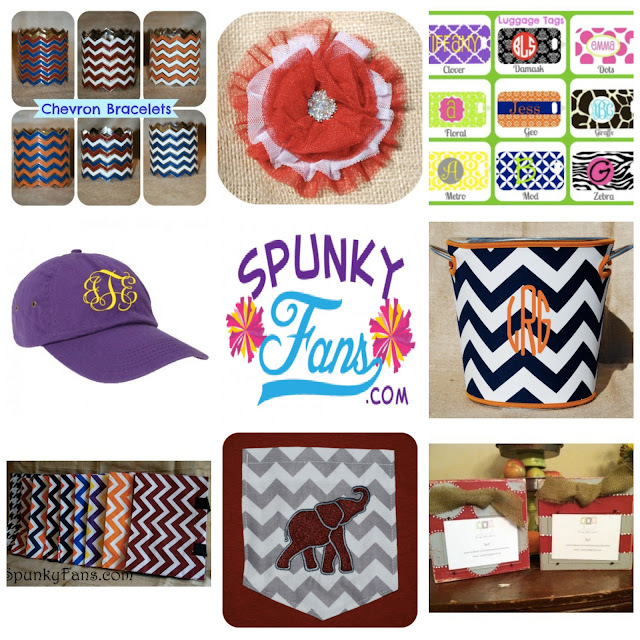 I'd get a monogrammed cap, a monogrammed chevron pocket tee, and a casserole carrier!! Like the state shirts especially Georgia. Would like something in PINK. Love the idea of WDE for a monogram! Such cute stuff. I love that houndstooth ice bucket! I gotta have the chevron bracelet! That chevron carrier would be fab all year long! What a cute casserole carrier!! Love the casserole carrier and the gameday tote! The Gameday Chevron Casserole Carrier are awesome... I can see us using these a lot !! Love the casserole carrier - hope it will hold my vintage Pyrex! Wow so cool! Great for our long drives and constant moves! I would get the casserole carrier and the game day carry all tote. So cute! I love the personalized ice buckets!! I would definitely buy some sweet Auburn gear! I'm not sure what I would pick, but I would have so much fun picking it out! Those Chevron bracelets are too cute! The Orange and Navy ice bucket. War Eagle!!! Wow. SO many cute things. I think my list of things would include these. I'd have to decide if I won which I really wanted most though possibly. I like the casserole carrier, the icebucket and the ipad cases are nice! I love your monogrammed casserole carrier, I definitely need that! I'm really not sure due to so much to choose from but right now I would say the PERSONALIZED CHEVRON TOTE BAG and maybe an otterbox for my phone. I would snag some of those super cute chevron bracelets! And a casserole carrier! Too cute! I would get a carry all tote and a casserole carrier. I would love a chevron casserole carrier! i would get an assortment of all the tailgate items, except the ice buckets, unless she made it in garnet and black! but definitely the casserole carrier, the big tote, and several solo cup koozies - what a great idea! I would have to pick something out for my niece who is in her first year of college and is enjoying all the sports activities. Huge football fan too! Love your Football Friday recipes! everything is so cute, I would have a hard time deciding. I'd buy a casserole carrier and a set of chevron bracelets! I love the Giraffe Monogrammed Otterbox Phone Case. I would buy the elephant diaper bag. I'm loving the chevron personalized bags! I would LOVE the casserole carrier! I'm always cooking and taking food places and really need something to keep my casserole dishes hot. so cute! perfect for tailgating! I love the chevron bracelets! If I won I would get the Game Day Chevron Carry All Tote. The casserole carrier, pocket T's, so many great, cute things!!! I would get the carry all tote! Love the casserole carrier, of course, I'd need a Gamecocks one! I would buy a casserole carrier most definitely and anything else maroon and white! Go Dawgs! I would buy whatever AUBURN gear I saw defiantly the koozie! All of the cute Bama stuff is killing me! Must win! Would love to see this in Razorback red!! I hope I win! Love your recipes. I have made many of them and they have all been fantastic. I want those bracelets! Oooo and the cup koozie! Ah! I would probably buy an adorable casserole carrier and a pocket t! There are so many cute things though! I would get the casserole carrier and some solo cup coozies!! Maybe a pocket tee though, everything is so cute! I'm loving the casserole carrier and the chevron bracelets! The Gameday Chevron Carry-All Tote for sure! Love the casserole carrier! But I love the monogrammed otterbox cases too! I love the casserole dish and the bracelets! WDE! I need this for church potluck nights! I would buy a personalized tablet case! I would get a carry all tote and a casserole cover...also i'd be thinking ahead to christmas gifts! I would have to get something with Bama on it for me and Auburn for the hubby! I would get the Game day Carry all tote(it could be use to tote things any where-tailgating included! ), the ice bucket, and the Solo Cup Koozie! So many cute items at Spunky Fans!! I am on the Gus Bus, WDE !!! I love, love, love the casserole carrier, and I NEEEEEEED it (in crimson and white, of course;). Roll Tide! WAR EAGLE! You know we take tailgating seriously down on the Plains! Would love the casserole carrier! I love the Casserole Carrier!! Go Tigers!! If I won the $100, I would sure take a good look at the awesome casserole carrier, the ice bucket, and that purple monogrammed hat! Really great gift ideas, too. Thank you so much for the opportunity to win! I love the casserole cover & the bracelets! What fun! I'd love one (or more) of the casserole carriers...what a great tailgating idea! I would DEFINITELY snag one of those casserole carriers! LOVE everything on this site!! I would get anything with UGA colors, especially those bracelets! loving the monogrammed caps and casserole carrier! Anything AUBURN for tailgates! I really love the casserole carrier. WDE! I would get a Personalized Platter and a Chevron Casserole Carrier. I really love the chevron and houndstooth patterns available. I like the monogrammed racerback tank and the pomchies. I've been wanting one of those casserole dish carriers! Would love pocket tee & bracelets!!!! Love all of this! WAR EAGLE! I like the insulated casserole carrier. Love the casserole carrier, tote and picture frames! Love the Hats and the koozies! I like the casserole carrier.